Mulberry is a British heritage brand with a rich history in luxury leather craftsmanship. The quintessentially British accessories specialist still creates many of its coveted bags from the same Somerset factory that founders Joan and Roger Saul set up in 1971. Handcrafted in carefully selected natural leathers, the bags are known for both their quality and style status; named after and inspired by Brit-cool girls including Alexa Chung and Cara Delevigne, these bags have become must-haves for style mavens around the world. 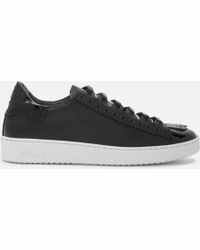 With a sporty high-top design and flexible rubber sole, Mulberry's collection of lace-up trainers are a directional choice. Crafted in the finest leathers and suedes, choose from feminine floral print, animal-print and studded styles.